I caught a glance of the cover of the 2012 L.L. Bean Summer catalogue today, and marvelled. I've been working on a paper for the Pacific Coast Theological Society on one of my favorite topics--the way mythology helps us understand ourselves and the cultures we create--and could not have asked for a better example. To celebrate their 100th anniversary, L.L. Bean has chosen to recreate painted catalog covers from the past as photographs. L.L. Bean opted to re-create the four covers as a way to pay homage to the original illustrations and to connect the store's illustrious past to what it hopes will be a long and vibrant future. L.L. Bean traditionally has hired artists, oftentimes Maine artists, to paint illustrations for its catalog covers. That tradition began with the earliest catalogs, and continues today as a way to link the outfitter with Maine's rich tradition of art and culture. The paintings generally project inviting images of Maine and the lifestyles of people who spend time outdoors. The four special covers will tell stories and convey images and values at the core of the retailer's mission, said L.L. Bean's creative director, Marcia Minter of Portland. They were chosen carefully, and reflect four of the most popular catalog covers over time, she said. "L.L. Bean is not just about selling stuff. L.L. Bean is also about a set of values," Minter said. "In each of these covers, you get a sense of those values. There is an element of family portrayed in every cover, of getting outdoors with your family and the special moments that happen when you do that." Reproduced on this site at Bob Keyes - Photographer puts new spin -- sign in required. What caught my eye about the cover, even before I knew it was a reproduction, is the direct appeal to a particular mythology and demographic. L.L. Bean's tradition, from "the earliest catalogs, and continu[ing] today" has to do with "project[ing] inviting images of Maine and the lifestyles of people who spend time outdoors." 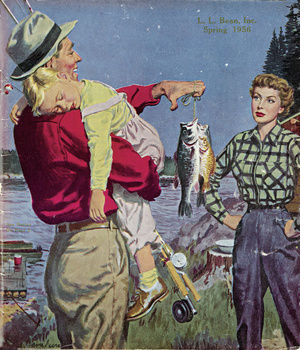 As one might expect from 1956 advertising, the lifestyle under consideration is that utopian fantasy now mostly dreamed of by those pictured--middle class white people who spend time buying products which suggest the outdoors. That L.L. 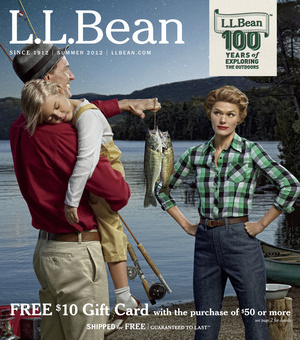 Bean knows its target demographic is not news, nor is the fact that it clings to gambits that get people to buy things by aligning with their gender stereotypes, class and race predjudices, and other less than savory motivations. Paying advertising professionals to address the right demographic with a compelling message is what corporations do, especially when their expressed purpose is to sell comodities to those identified as potential consumers. What matters is how a citizen understands this process. It has become a survival necessity to see the world that is being created by the products and messages being bought and sold today in almost every moment of life. What makes this cover retrospective worth writing about is that these tactics still work, rather than being seen as a bit sad and naive. Your response to their mythologizing is news. The Big News of the past fifty years has been the number of people who don't seem to notice that the way they think, feel, believe, and vote, with dollars as well as ballots, is being crafted with little concern beyond mass production and viral sales. It must be said that few individual corporations or advertising campaigns are responsible for legally actionable false-advertising, to hoodwink so you don't get what you pay for. At the same time, almost every advertising campaign of any size would like you to buy a single world view--one way of looking at things that is not in your best interest because it is too simple. If we define "family" without thinking, for instance, or fail to notice the ways our children's loyalties and attention are bought and sold, we set ourselves up for casting our financial votes for those who have decided they cannot afford to consider the needs of human beings, i.e. us, much less other creatures and the best decisions being sought in relationship to entire ecosystems. Again, I do not mean to imply in this article that any illegal activity is taking place. I merely draw your attention to the mythological facts. Keyes of the Portland Press Herald quotes L.L. Bean's creative director, Marcia Minter: "The four special covers will tell stories and convey images and values at the core of the retailer's mission." This storytelling involves activating a mythology, perhaps "Americana", which conveys core images and values in a way that bespeaks a mission that is devoted to retail sales. The covers "were chosen carefully" because "L.L. Bean is not just about selling stuff. L.L. Bean is also about a set of values." Any set of values being sold, however, is not a simple transaction. When you buy generalities you also bring home specifics. The "element of family [being] portrayed in every cover" is a specific idea of family, class, race, and a way of life that, when believed, can lead to a very narrow world view indeed. When you respond to the covers by "liking" them on Facebook or buying the products they conceal, what message are you sending?